Simao’s interest in art began at an early age in his home town of Jingdezhen, the porcelain capital of China. He would spend hours as a child watching as family members created patterns and paintings on ceramic pieces. His passion for design enabled him to pursue a major in art, attending a middle school, high school and university that all taught majors in Fine Arts. For twenty years he has experimented with a number of styles and mediums culminating in his most recent series the Edge of Reason. 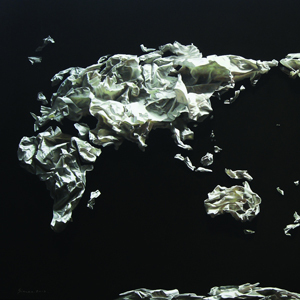 Edge of Reason is a series of oil paintings which makes prominent use of paper as the subject matter. The figures painted in these works contain people, figures or objects shaped with realistic looking paper. In most cases these figures are in the foreground. Some are walking tightropes, leaping, dancing, snowboarding, flying, while others are simply dangling on swings suspended surrealistically in the sky. Behind them are backgrounds painted in deep hues of brown or grey. Floating clouds, brewing storms or famous Chinese landmarks hover behind the white figures. The eyes are the window to the soul. The life-like figures are rendered inhuman with the inability to glimpse into their souls, blocked by the darkness of the sunglasses. One must question whether it is the viewer who is rendered blind to their souls or if it is the figures that are blind to what surrounds them. And yet, if one looks carefully the white paper figures are flecked with strokes of red paint. Blood? A soulless humanity? These soulless people are playing with danger. The ropes they walk on are often frayed, about to break, on the edge of danger, about to fall to their demise. And yet, they appear carefree and natural. Simao has carefully combined symbolism with technique to create masterpieces that produce contemplation as to the deeper meanings hidden behind the cleverly painted figures. What differentiates Simao’s works from other Chinese contemporary artists is that his paintings depict a subject that not only relates to Chinese society but all of humanity: the blind pursuit of pleasure masked by what can be thought of as a care free life, freedom. With the opening up of Chinese society in the 1980s many people pursued pleasure, money, women, but found as time passed they had lost everything. Although these works stemmed from Simao’s analysis of Chinese society, collectors from other countries often relate these works to their own environments. They depict a phenomenon that exists not only amongst Chinese people but also all of mankind, blindly living on the edge of reason. Creative Quarterly, The Journal of Art & Design. Artisanal Media, No. 40, p.10 25, 2014.